June is a wonderful month in the Loire Valley because all the roses are out. I’ve already told you the story of our Madame Meilland or “Peace” roses and our Pierre Ronsard climbing roses. Yesterday morning, as we were having breakfast in the kitchen, which looks out into the courtyard in front of the house, I realised that the stone wall next to the front gate was looking a little bare. We discussed the possibilities and decided climbing roses would be the perfect solution. So in the afternoon we went to visit the botanic gardens at Prieuré d’Orchaise, only 11 kilometers from Blois, who were selling rose bushes this weekend. 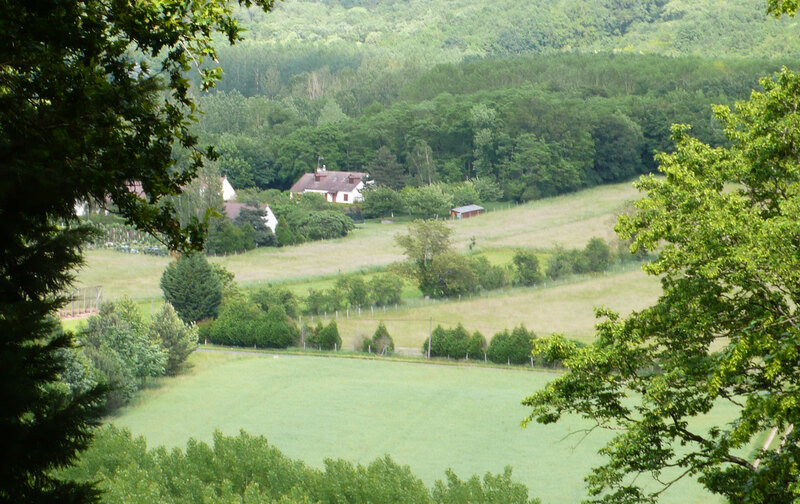 This delightful 3 hectare park overlooking the luxuriant Cisse Valley, is next to a Romanesque bell-tower built in 1060 by monks from Marmoutiers. 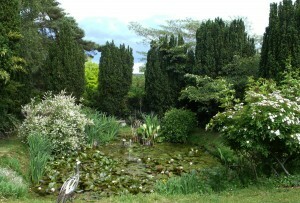 The garden’s founder, Hubert Treuille, has collected more than 2,000 varieties of plants from across the globe. 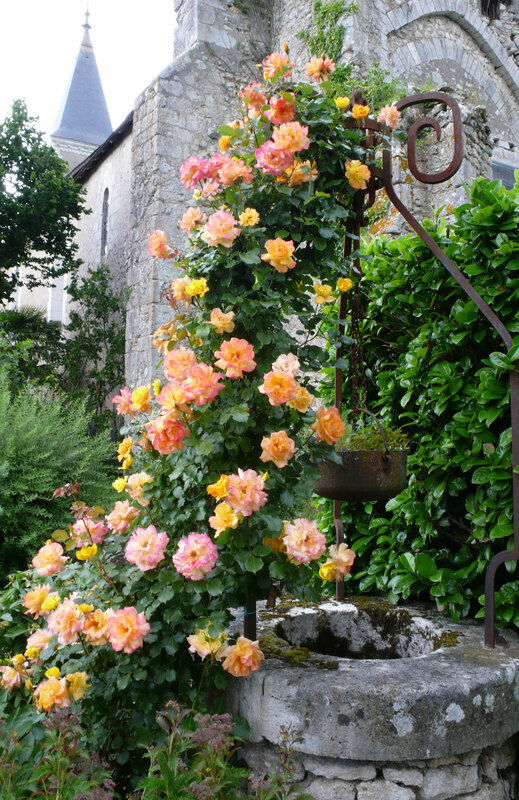 When we got there, we spoke to the very friendly and helpful gardener and told him what we wanted – a hardy climbing rose that would have lots of flowers very quickly. He suggested a variety called Saharan whose flowers change from pink to abricot as they mature. I didn’t find the potted example he showed us particularly appealing so he sent us to look at a well in the garden where the roses were growing. It was so stunning that we immediately went back and bought it as it was the only one left! 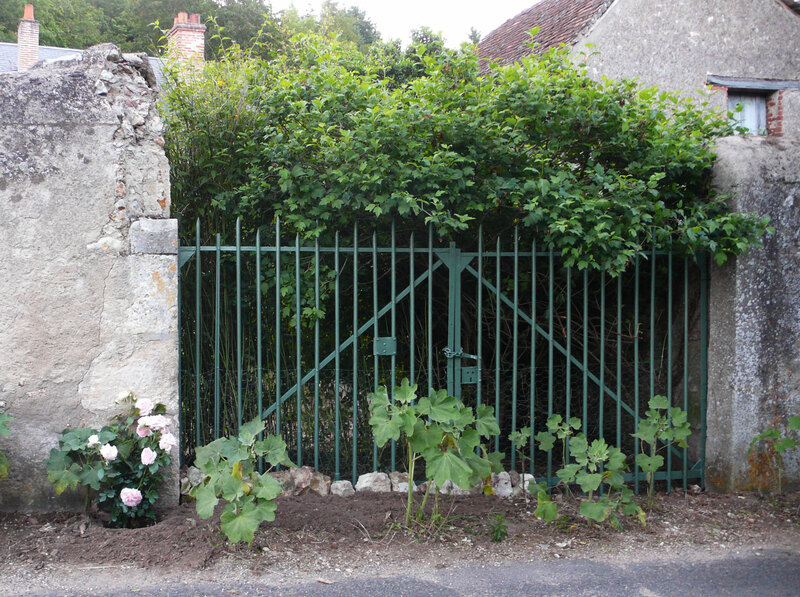 We thought we should also have a climbing rose outside the front fence (well, it’s a stone wall really) on the second disused gate that we’ve just repainted. We initially thought we’d had to replace it altogether but after treating it for rust, repainting it and removing the black plastic from behind, it is as good as new and ready for our new Pierre Ronsard. We then got the gardener to explain how to prune our different rose bushes so that they would be as lovely as his. I knew you had to cut off the faded roses but wasn’t sure exactly how. So he showed us that below the flower, you first have a cluster of three leaves, then five, so you should always cut just (on a slant) above the cluster of five. That way, you’re encouraging the new wood to grow. When you’re pruning in the spring, you have to cut off the dead wood and prune drastically. 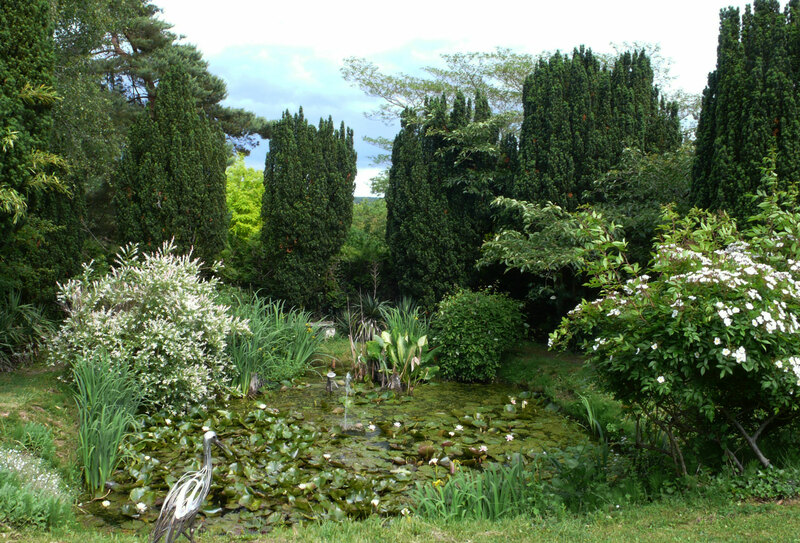 After we’d bought our roses we then went to visit the rest of the garden which is very lovely and has a beautiful waterlily pond with cypresses in the background. We had just missed the peonies but will make sure we go there earlier next year during the peony weekend and buy a few bushes. And we’ll definitely be visiting regularly to get helpful advice from the gardener who even gave us his phone number! Adults: €6 (free for children under 12). 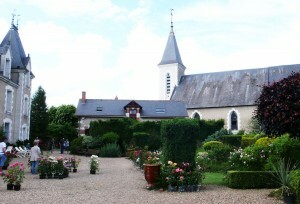 This entry was posted in Flowers & gardens, France, Loire Valley and tagged Pierre Ronsard, Prieuré d'Orchaise, Saharan. Bookmark the permalink. If they are pruned properly it seems they become increasingly prolific. The Pierre Ronsard still has a few blooms in winter!